The Creative Princess: Welcome Home! A few days ago I had the privilege to take my sweet friend Mrs. A to the airport to pick up her hubby. Mr. A came home on leave and got here just in time to be here for the birth of their first baby. So sweet! 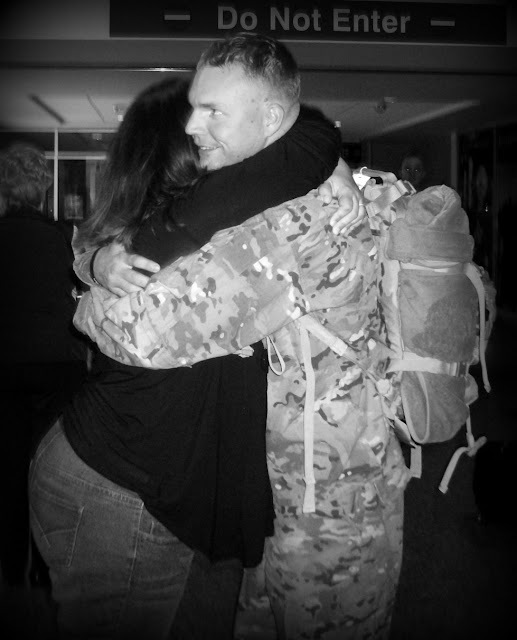 If you are ever lucky enough to be at the airport when a soldier comes home, it will be an event you will NEVER forget. The range of emotions is crazy, you are very proud, very happy and you cry. At one point I asked Mrs. A if she was going to cry and she said she was too excited to cry. WHATEVER! I told her I would be crying enough for the both of us then. HA! Mr. A was one of the last ones off the plane so Mrs. A and I were able to watch all of the other homecomings. 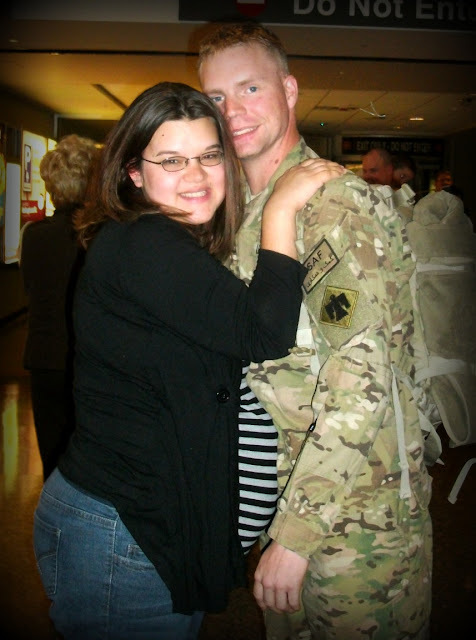 They were all sweet in their own way but other than Mr. and Mrs. A's it had to be the soldier that was the first off the plane. Waiting on him was his wife and little boy. The little boy couldn't have been over two, he was so cute and ALL boy. The moment he looked up and saw his dad is a moment I know I will never forget. I even cry now just thinking about it. It was truly one of the sweetest events I have ever witnessed. When the little boy looked up and realized it was his dad he took off running. The dad knelt down and scooped the little guy up in his arms. There was not a dry eye in the waiting area....not even Mrs. A's were dry. After what seemed like FOREVER Mr. A FINALLY made his appearance. It was awesome! Beautiful. Sweet. Unforgettable. We are so glad you are home Mr. A. Thank you for your service! Oh and at this moment, as I type this (which as you are reading this will have been last night) Mr. and Mrs. A are at the hospital waiting on the arrival of sweet Baby A. I will keep you all updated and if allowed, I may even sneak a pic or two on here for you.